Fun planners are all the rage these days. So many people have caught the bug and are adding stickers, doodles, and washi to their plans. This new trend is even crossing over into the homeschool planner space. Totally fun. 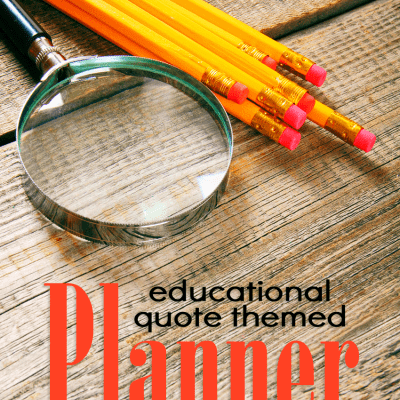 But even more important than a fun homeschool planner is one that is functional. A good homeschool planner will help you flex when life changes and reduce decision fatigue. It will also keep handy those elements that are most important to your homeschool. Here are seven things to include in your homeschool planner to make sure you have an awesome homeschool year. Washi tape optional. While it’s fun to start your homeschool planning with shopping, a better place to start is by creating a vision statement for your homeschool. What is important for you to include in your child’s education? What do you need to give them the space to do each day? What subjects are must-dos in your home? What skills would you like for them to have when they leave home? 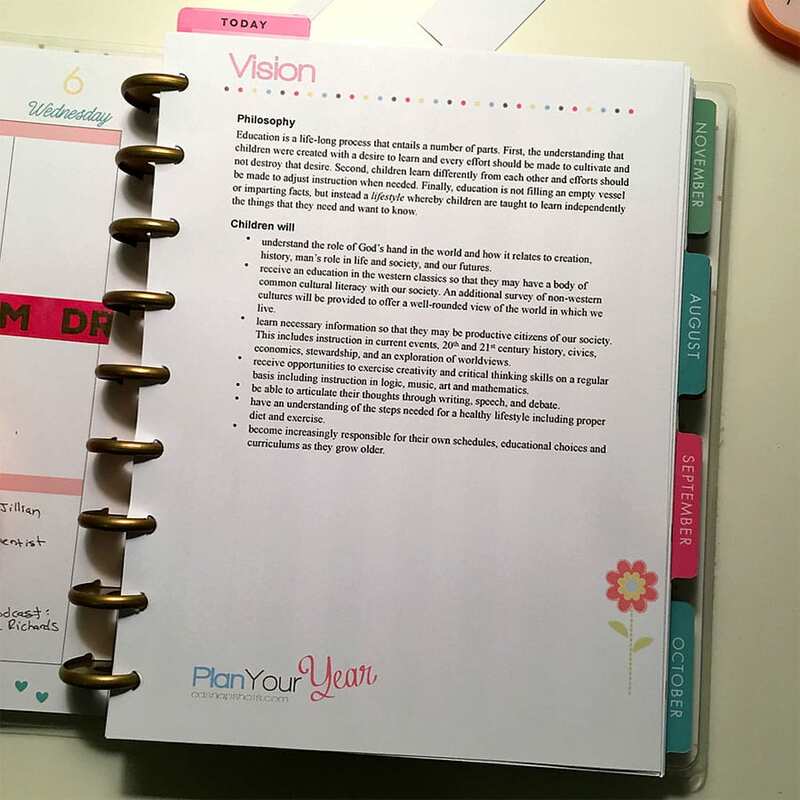 Once you have your vision in place then print it, include it in your planner, and refer to it before you make decisions about curriculum purchases, extracurricular activities, and course of study. If you would like some hand-holding on how to write a homeschool vision, you can check out this free 30-minute webinar on how to get it done. 2. Goals for each student. Once you have an overall vision, the next step is to create goals for each of your kids for the school year. Goals give you an idea of what their current strengths and weaknesses are and how you can play to the strengths and address the weaknesses. Frustrated by setting goals that you never actually accomplish? Check out my favorite goal-setting tip for goals you will complete every single time. Keep your goals in your planner so you can periodically refer to them throughout the school year and check your progress. It is helpful to plan a date on the calendar so you remember to check-in. Having a print-out of your state requirements for homeschoolers handy is a good homeschool practice. This way, you know your exact legal obligations for the school year without guessing. How many hours of school are you required to complete? How many days? Which subjects are you supposed to cover? This is not to chain you to the dictates of “the man,” but actually helps you in a couple of ways. First, if you are ever given incorrect information (from a school official, another homeschool mom, etc) then you will be easily armed with what you need to know. Second, most states actually require less than many homeschoolers think they do. So often local homeschool moms think they have to do way more than they actually do. Having a handy copy of the requirements reminds you to think before you freak out about the new career class all ninth graders need to take. Why? Because it isn’t required of homeschoolers. You can find state-by-state homeschool requirements here. If you have a high school student I would also add admission requirements for your chosen colleges to this list of must-haves. This might be a letter of intent, a state-issued form, or a document or card issued from a cover school. 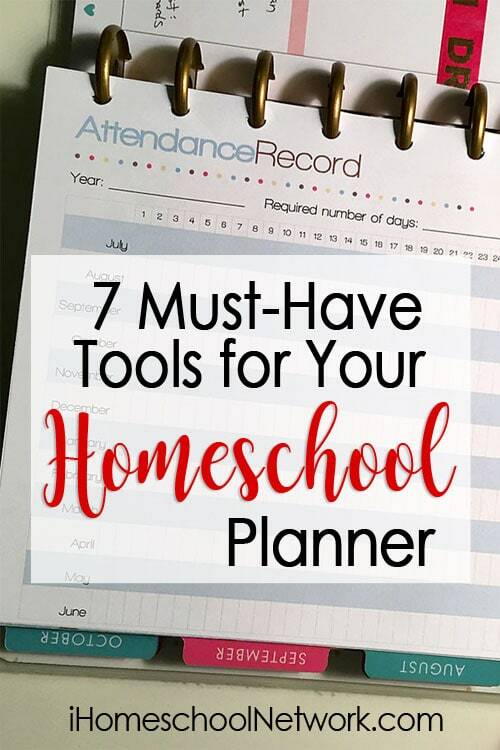 It is always handy to keep a copy of it right at your fingertips in your homeschool planner. While the chance of you ever needing it for an emergency situation is very slim, you do not want to be stumbling around looking for it if the need ever arises. Calm your nerves and look cool and competent by being able to put your fingers on it in a few seconds. When you know where it is, it is also easier to sign-up for all of those great teacher discounts and freebies most businesses extend to homeschoolers with proof of homeschooling. One of the biggest obstacles to peace in the homeschool day is decision fatigue. You are constantly being pulled in different directions, forced to answer questions, and decide what to do next — often while under mental assault from a toddler (or teenager). 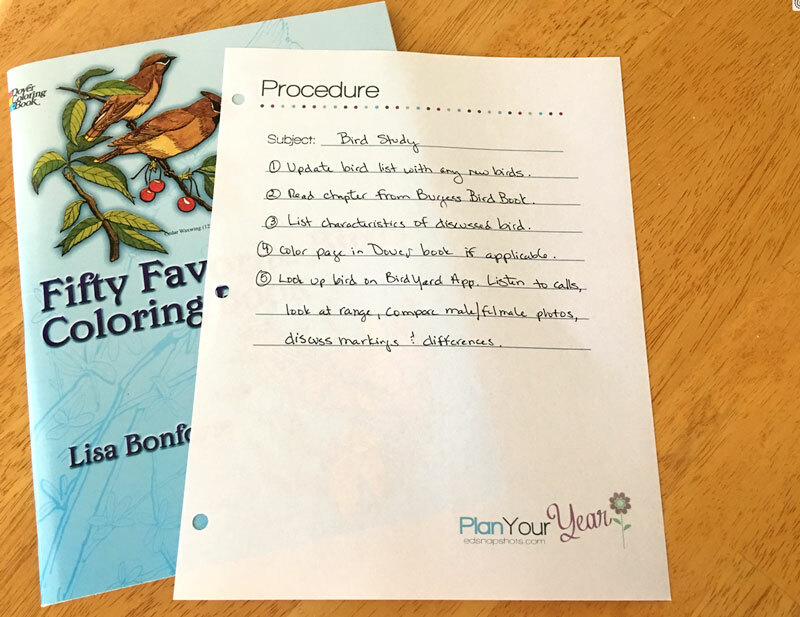 Eliminate much of the decision fatigue and stress of homeschooling by creating procedure lists for any subject that is not open-and-go. Having this simple plan in place allows you to put your homeschool day on auto-pilot, get more done, and worry less. You can find my step-by-step plan for creating procedure lists here. Pull out your highlighters, this is where the fun starts. Use our handy calendar form to plan which days you will do school each month. This video walks you through how to do that. Are you going to school year-round? Do you want to try sabbath schooling (six weeks on and one week off) or some other variation? Maybe you want to go with the flow and follow my magic number technique for scheduling your homeschool (see number four here). Whichever you choose, having a plan in place will help you be more consistent, and therefore more successful, in your schooling. Most states require some form of attendance tracking even if they require little else in the way of homeschool paperwork. 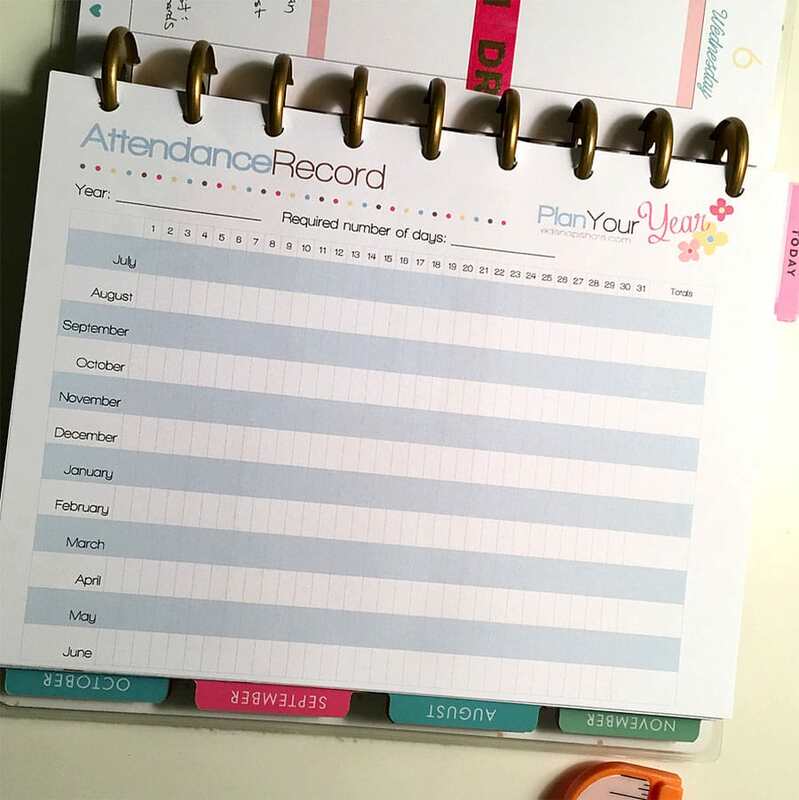 Attendance trackers don’t have to be fancy, but they do have to be practical — I find it is one of the hardest things for me to remember to keep up with. So you might decide to have a special form in the front of your book or simply make a mark on the corner of your calendar days. Whichever you choose, try to remember to be consistent. Also, remember that learning happens everywhere so you don’t have to sit at the table and open a textbook for learning to have occurred. A great (and organized) homeschool year is in your grasp when you add these seven things to your homeschool planner. So add those decorations and dust off the gel pens, but don’t forget it’s the plan that makes the planner. Have a good year! Pam Barnhill believes that you don’t have to sacrifice relationships to homeschool strong. An award-winning educator and former journalist, she has a knack for breaking down big tasks into small, manageable steps and getting to the heart of the stories her listeners want to hear. Pam is the host of three popular homeschooling podcasts -- The Homeschool Snapshots Podcast, Your Morning Basket, and The Homeschool Solutions Show. She lives in the Deep South with her husband, three (mostly) awesome kids, and two slightly neurotic pugs. You can find her online at pambarnhill.com.